Swami Vivekananda (1863-1902) was anti-caste in many of his recorded emphases. He was an unusual mystic of the more daring and radical kind in terms of social extension. Yet he identified with the traditional philosophy of Advaita Vedanta, strongly associated with Shankara (c. 800 CE), a legendary exponent whose extant and attributed treatises are a subject of complex scholarly appraisal. Vivekananda, alias Narendra Nath Datta, was born in Calcutta, where he attended college. He studied European history and philosophy, gaining a Bachelor of Arts degree in 1884. He became influenced by the Brahmo Samaj, a reforming movement which advocated belief in a formless God, and who were in opposition to popular Hinduism. Narendra came from a low class background, being a kayastha by birth. That sub-caste gained an increased status in Bengali society under British rule, often working as clerks and secretaries. His father was a prosperous attorney at the Calcutta high court. In 1881 Narendra encountered Ramakishna of Dakshineswar (1836-1886), a brahman saint who lived in a Kali temple near Calcutta. Ramakrishna was not at all typical of the priestly caste; he would not touch money and spoke in very simple language, as distinct from the formal didactic of the pundits. The tendency of Ramakrishna was eclectic with regard to Hinduism, and included reference to Advaita Vedanta. Narendra at first rejected Advaita, deeming this an extremist philosophy. Ramakrishna’s esteem for the goddess Kali was also repugnant to reformist tastes. Yet prior to 1886, the year of Ramakrishna’s death, Narendra had changed orientation completely, becoming a full-fledged disciple of the mystic. The young disciples of Ramakrishna opted for a monastic existence at his death, living in a dilapidated house at Baranagore. A number of them took formal vows; Narendra assumed the name of Swami Vivekananda. In 1888, he left Baranagore to live as a wandering monk (sannyasin). For several years he travelled throughout India, frequently travelling on foot; he resorted to the railway when given tickets by wellwishers. He encountered priestly pundits and maharajas, but also saw at firsthand the widespread poverty and suffering of the masses, which evidently weighed upon him deeply. At the end of 1892, he arrived at Cape Comorin (the southern tip of India). There he gained a much reported insight: the situation of so many wandering renunciates teaching religion was seriously discrepant. Instead the objective should be one of raising the masses from ignorance and hunger. 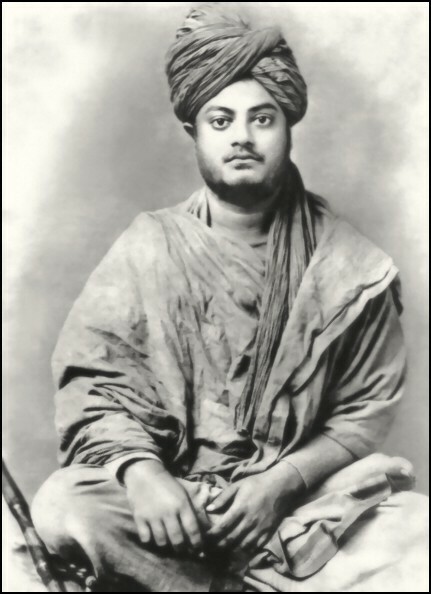 In 1893, Vivekananda visited America as an outspoken teacher of Vedanta and Yoga. He first lectured at the Chicago Parliament of Religions, gaining both admirers and critics, the latter including missionaries to India. For over three years he stayed in the West, lecturing in America and England; he suffered poor health as a consequence of the strain. He declined two offers of an academic chair in Eastern philosophy at Harvard and Columbia Universities, explaining that he could not accept such career vocation as a wandering monk. In early 1897, Vivekananda arrived back in India, being welcomed as a national hero on account of his recent fame. He travelled from Colombo to Calcutta and Almora, frequently giving lectures that included exhortations to an upliftment of the masses and the elimination of caste stigmas. He also favoured the study of Western science in addition to Vedanta. The implications of a national reorientation were taken seriously in some directions; later political figures like Mahatma Gandhi and Radhakrishnan (entry no. 27) acknowledged Swami Vivekananda as an inspiration. Independence from British rule was one repercussion. However, Vivekananda did not mount that sort of campaign. Instead, his immediate opponent was the conservative priestly caste. He detested what he called the “kitchen religion” of the elite caste, a belief system entailing a taboo on food being defiled by the shadow of any untouchable. “Kick out the priests who are always against progress,” said Vivekananda. “The modern student of sociology may well be surprised at the depth and objectivity of his observations.” Quotes from F. R. Allchin, “The Social Thought of Swami Vivekananda,” in S. Ghanananda and G. Parrinder, eds., Swami Vivekananda in East and West (London: Ramakrishna Vivekananda Centre, 1968), pp. 89ff., 102. See also my web memo. At Calcutta in 1897, Vivekananda founded at Belur the Ramakrishna Math (monastery). This was accompanied by the Ramakrishna Mission, an extension in social service. Some Christian critics have implied that the Mission was inspired by Christian models. The new monastic organisation later gained a centre in Madras. 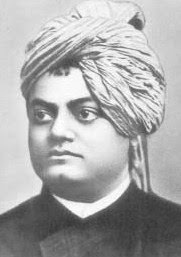 During 1899-1900, Vivekananda again visited America and Europe, creating Vedanta centres in San Francisco and New York, and also attending the Paris Congress of Religions (1900). His failing health meant that he was unable to meet an invitation to the subsequent Congress of Religions in Japan. Vivekananda died peacefully at the Belur monastery, while lying down after meditating. An Indian historian observes that Vivekananda “was often strongly anti-Brahmin, if not also anti-Brahmanical, and held saints and sadhus no less responsible for the continuing oppression of the masses. Reformers, in his view, never really touched the pulse of India…. Vivekananda’s panacea for India’s several ills was mass education: training in useful sciences and crafts, manual skills, and manufacture.” Quote from Amiya P. Sen, ed., The Indispensable Vivekananda: An Anthology for our Times (Delhi: Permanent Black, 2006), pp. 33-4. A generally obscured matter is that Vivekananda drew from both the Sankhya and Vedanta systems of philosophy. He emphasised features of Sankhya psychology, and admitted the indebtedness of Vedanta to Sankhya; substantial doctrinal differences existed between those two traditions (ibid., p. 40). The Ramakrishna Order now claims over 170 branch centres worldwide. There is an online partisan biography of Vivekananda by Swami Nikhilananda. See also the Complete Works of Swami Vivekananda (nine vols, Mayavati, 2001), and web version. Relevant is S.N. Dhar, A Comprehensive Biography of Swami Vivekananda (2 vols, Madras, 1975-6); A. P. Sen, Swami Vivekananda (New Delhi, 2000); Sen, Social and Religious Reform: The Hindus of British India (New Delhi, 2003). See also Amiya Prosad Sen.